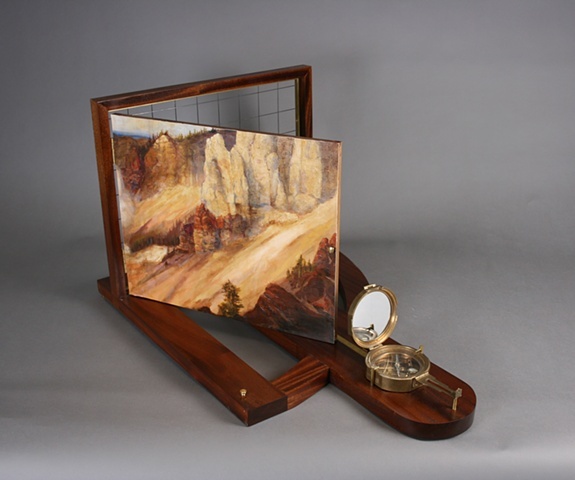 32" x 20" x 18"
This piece is based on a portion of Thomas Moran's painting, The Grand Canyon of Yellowstone ( 1898-1901) and includes a Stanley surveyor's compass sighting toward a portion of the painting. The painting pivots away to reveal a metal grid similar to those used by mural artists. The whole piece feels as though you could take it to the site as a transit to locate the specific portion of the painting.